I'm working on the Colgate Total� and American Diabetes Association�s #30daysOfLOL campaign and really enjoying it - hope you are too! #30daysofLOL twitter chat - BE THERE ! 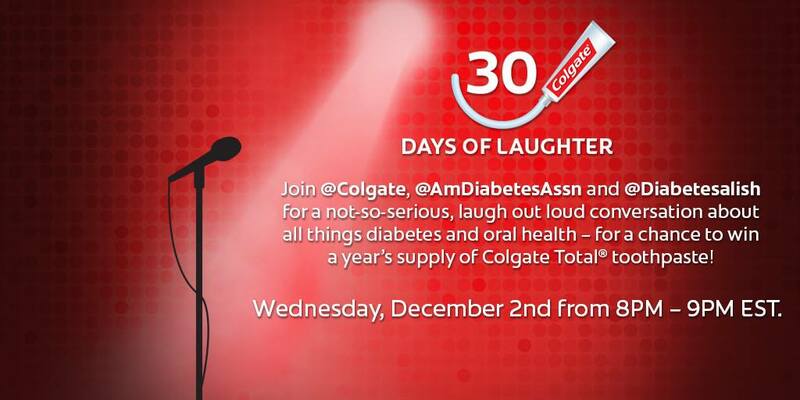 I'm incredibly stoked to announce that I�m part of the Colgate Total, American Diabetes Association's #30daysofLOL hour long twitter chat that occurs tomorrow, Wednesday December 2nd, from 8 to 9pm, ET. 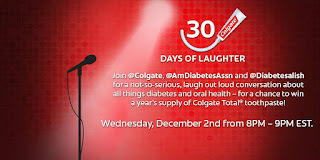 From the bottom of my busted pancreas, I hope you'll follow me (@diabetesalish,) @Colgate Total, @AmDiabetesassn, and the #30daysofLOL hashtag, join in the convo and dish about diabetes/oral health and all the stuff that has the potential to drive us bat crazy if we didn't laugh about it! Plus, I'm looking forward to what you have to say and all of us picking up a few tricks of the diabetes/oral health trades! ****Wednesday night on the twitter from 8pm on, is going to be a fantastical night in all dimensions for people with diabetes!